'Al' Bowlly was a popular singer in the United Kingdom during the 1930s, making more than 1,000 recordings between 1927 and 1941. His song "My Woman" was resurrected as a chart-topper in 1997 as Your Woman. Bowlly was born in Maputo, Mozambique, 1899, to Greek and Lebanese parents who met en route to Australia and moved to South Africa. He was brought up in Johannesburg, South Africa, and killed by the explosion of a parachute mine outside his apartment in London, England during the Blitz. Bowlly showcased a range of material unsurpassed by any contemporary other than perhaps Bing Crosby. He was also a true international recording artist. After a series of odd jobs across Europe in his youth, he gained his musical experience singing for a dance band led by Jimmy Liquime on a tour of India and Singapore during the mid-1920s. However, he fell out with Liquime and was fired whilst the band was still in India. Bowlly had to work his passage back home, through busking. Just one year after his 1927 debut recording date in Berlin, Bowlly arrived in London for the first time as part of Fred Elizalde's orchestra. That year, "If I Had You" became one of the first popular songs by an English jazz band to become well known in America as well, and Bowlly had gone out on his own by the beginning of the 1930s. First, however, the onset of the Great Depression in 1929 resulted in Bowlly being made redundant and returning to several months of busking to survive. In the 1930s, he was to sign two contracts which were to change his fortunes - one in May 1931 with Roy Fox, singing in his live band for the Monseigneur Restaurant in London, the other a record contract with Ray Noble's orchestra in November 1930. During the next four years, he recorded over 500 songs. He also found time to occasionally record with other orchestras such as Lew Stone's ; however, he was inundated with demands in this period, and made the bulk of his recordings with Noble. There was considerable competition between Noble and Fox for Bowlly's time, as for much of the year, Bowlly would spend all day in the recording studio with Noble's band, rehearsing and recording, only to then spend the evening playing live at the Monseigneur with Fox's band. A visit to New York in 1934 with Noble resulted in more success and their recordings first achieved popularity in the USA; he appeared at the head of an orchestra hand-picked for him and Noble by Glenn Miller (the band included Claude Thornhill, Charlie Spivak, and Bud Freeman, among others). During the early-mid 1930s, such songs as "Blue Moon", "Easy to Love", "I've Got You Under My Skin", and "My Melancholy Baby" were sizable American successes ? so much so that Bowlly gained his own radio series on NBC and travelled to Hollywood to co-star in The Big Broadcast in 1936, which also starred one of his biggest competitors, Bing Crosby. 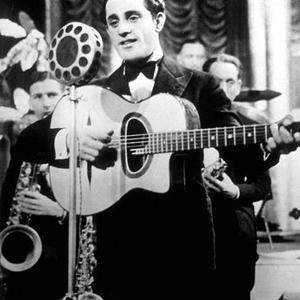 Al Bowlly often worked with Ray Noble and His Orchestra. In December 1931, Bowlly had married Freda Roberts, but the marriage proved a disaster, with Bowlly discovering his new wife in bed with another man on their wedding night. The couple separated after two weeks, and sought a rapid divorce. He remarried in December 1934, this time to Marjie Fairless, the marriage lasting until his death. Despite Bowlly's stellar success in Britain through the early 1930s, he never achieved the same measure of fame in the USA, and his absence from the UK when he moved to the States in 1934 damaged his popularity with U.K. audiences. His career also began to suffer as a result of problems with his voice from around 1936, which affected the frequency of his recordings. He and Marjie moved back to London in January 1937, with Bowlly appearing with his own band, the Radio City Rhythm Makers, but they had dissolved by late 1937 when his vocal problems were traced to a wart on the inside of his throat, which briefly caused him to lose his voice entirely. He flew back to the USA to successfully undergo major throat surgery for its removal, but had further difficulties with his voice late in his career. With his success in Britain a shadow of its former self, he toured regional theatres and recorded furiously to make a living, moving from orchestra to orchestra, including those of Sydney Lipton, Geraldo, and Ken Johnson. He underwent a brief revival from 1940, as part of a double act with Jimmy Messene (whose career had also suffered a recent downturn), with an act called Radio Stars with Two Guitars, performing on the London stage. It was his last venture before his death in April 1941. The partnership was an uneasy one, as Messene suffered from a serious drinking problem by this stage, and was known to turn up incapable on stage, or not to turn up at all, much to Bowlly's consternation. Bowlly's last recorded song, made two weeks before his death, was a duet with Messene of Irving Berlin's satirical song on Hitler, "When That Man is Dead and Gone". The evening of his death on April 17, 1941, Bowlly and Messene had just given a performance in High Wycombe and both were offered the opportunity of spending the night there, but Bowlly opted to take the last train home to his flat in Jermyn Street, London instead. Bowlly's decision proved to be fatal; he was killed by a German Luftwaffe parachute mine which exploded outside his apartment later that evening. Bowlly's body appeared unmarked - the blast had not harmed him, but it had sent his bedroom door off its hinges and the impact against his head proved fatal. Some speculation surrounds his age at the time of his death. Bowlly claimed at the time of his death that he was born in 1899, making him forty-two, but his death certificate gives his age as forty-three, and several contemporaries claimed that the perpetually boyish-faced singer was born as early as 1890. As no birth certificate exists, and much of his early years in South Africa remain shrouded in mystery, his actual age may remain unknown. Al was buried with other bombing victims in a mass grave at the Westminster Cemetery, Uxbridge Road, Hanwell, London, where his name is spelt Albert Alex (sic) Bowlly. In 1986, British singer/songwriter/guitarist Richard Thompson paid tribute on his album Daring Adventures with the song "Al Bowlly's in Heaven". Bowlly remains one of the most highly regarded singers of his era because of his extraordinary range, his command of pitch and rhythm, and above all, the sincerity with which he could deliver a lyric.